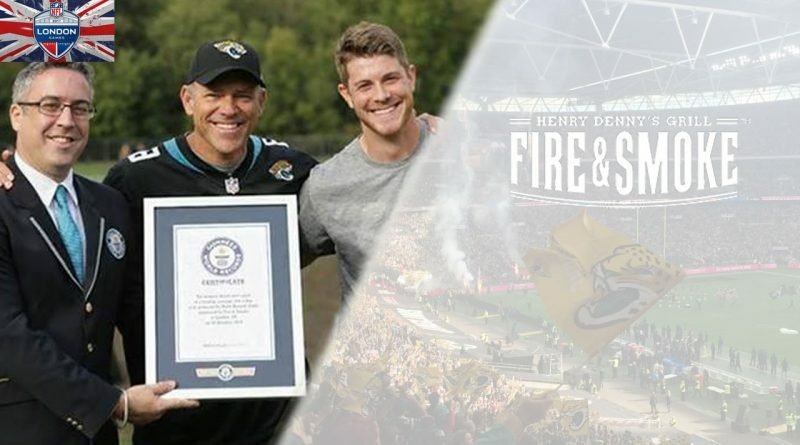 Former Jacksonville Jaguars QB Mark Brunell has set a new GUINNESS WORLD RECORDS title for the longest throw and catch of a hot dog sausage into a bun on his first attempt. The record throw was 20.96 metres away – the length of two London buses. Brunell was picked by the Jaguars to take on the tough challenge in celebration of their recent partnership with Fire & Smoke – a cooked meat brand specialising in flavour from the American Deep South – and the upcoming Jaguars game at Wembley on 28th October. The receiver for the World Record was Ryan Moore, Jacksonville Jaguars’ UK Marketing and Events Manager. The new record was judged by GUINNESS WORLD RECORDS adjudicators, following strict guidelines that required the hot dog to be no longer than 5.5 inches in length and that it must be caught in a pre-sliced seven-inch bun. To ensure the official record was achieved, Fire & Smoke worked with food scientist Dr. Stuart Farrimond to undertake exclusive research into the aerodynamics of a hot dog. He advised Brunell on the optimum throwing techniques, considering precise angles, speeds and dimensions – concluding in an immense 2,830-word report. Using advanced supercomputing technology to test Fire & Smoke’s hot dogs, Dr. Farrimond revealed that a hot dog is, in fact, more aerodynamic than an American football and if thrown upwards, end-on, at a 40-degree angle, the sausage could fly up to 71.6m. “In order to assess the flying potential of the hot dog, we created a virtual wind tunnel environment using a supercomputer suite, which allowed extremely precise computer analysis of airflow and turbulence. “This was no easy challenge, but we did it! When Fire & Smoke asked me to step up to the task of throwing the longest hot dog to, it was a no-brainer!